That kind of patience may be coming to an end. Bank regulators have issued warnings on the risks involved in lending to U.S. drillers, threatening a cash crunch in an industry that’s more dependent than ever on other people’s money. Wall Street has been one of the biggest allies of the shale revolution, bankrolling thousands of wells from Texas to North Dakota. The question is how that will change with oil prices down by half since last year to $50.36 a barrel. “Lenders in general are increasing pressure on oil companies either to raise more equity or do some sort of transaction to pay down their credit lines and free up extra cash,” said Jimmy Vallee, a partner in the energy mergers and acquisitions practice at law firm Paul Hastings LLP in Houston. Banks are already preparing for the next re-evaluation of oil and gas credit lines, reviews which typically take place twice a year in April and October. 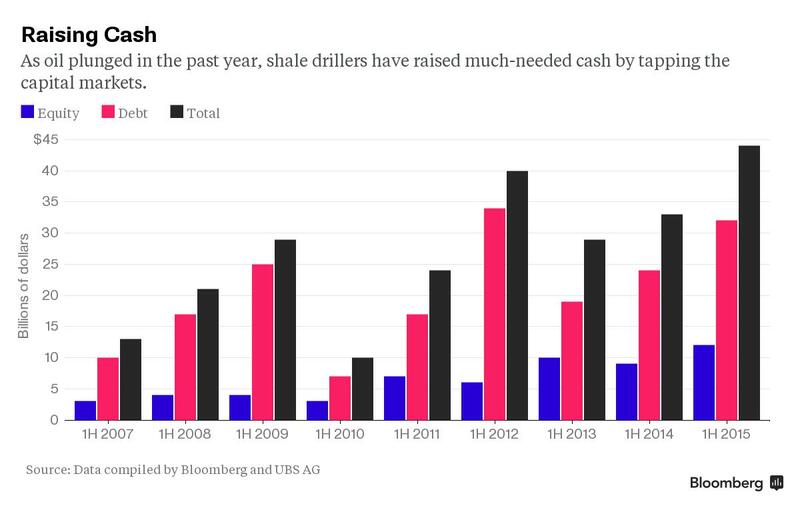 The loans are based on the value of drillers’ producing reserves, which has shrunk as oil prices fell. Many companies are also losing protection as hedges that locked in prices as high as $90 a barrel begin to expire. Banks so far have been willing to keep the money flowing because drillers that come close to maxing out their credit lines have paid them off by tapping public markets. U.S. producers have raised about $44 billion through bonds and share sales in the first half of this year, the most since 2007, according to data compiled by Bloomberg and UBS Group AG. Now the appetite for that debt is dwindling. Bonds have become more expensive and are laden with more onerous terms, including liens against drillers’ oil and gas assets. The average coupon has increased to 6.84 percent in 2015 from 6.36 percent in 2014, according to data compiled by Bloomberg. Some of the bonds issued this year are already trading at levels indicating financial distress, including $1.25 billion issued last month by SandRidge Energy Inc. More than $22 billion out of the $235 billion in debt owed by the 62 companies in the Bloomberg North America Independent Explorers and Producers index is trading at distressed levels. Their yields are more than 10 percentage points above U.S. Treasuries, as investors demand higher rates to compensate for the risk they won’t be repaid. Halcon swapped some of its debt for shares this year to help reduce borrowing costs, leaving some bondholders with stock that was worth less than they were owed. The company also issued a $700 million second-lien bond in May. Representatives for Halcon in Houston and SandRidge in Oklahoma City didn’t return calls and e-mails seeking comment. In the event of a Halcon default, Standard & Poor’s estimates that unsecured bondholders would get, at most, 10 percent of the almost $2.6 billion they are owed. Banks have first dibs on most of the company’s assets. Other investors will get next to nothing. Even so, banks aren’t eager to take over drilling the oilfields themselves. “They certainly don’t want to push anybody over the edge because the last thing the banks want to do is to try to run a company,” said Robert Gray, a partner at law firm Mayer Brown LLP who has worked on company restructuring. Banks are under pressure from regulators to more frequently review their energy lending and cut back credit lines as the value of collateral drops. In April, the U.S. Office of the Comptroller of the Currency flagged oil and gas loans as one of the lending industry’s biggest emerging risks. Wells Fargo saw a $416 million increase in past-due loans in the second quarter, most of them energy-related, the company said in a July 14 presentation. The impact is “relatively immaterial,” CFO John Shrewsberry said. JPMorgan set aside $140 million to cover potential losses on oil and gas loans, Lake, the CFO, said during the bank’s conference call. This entry was posted in Alternative Credit and tagged Article, COF, GHP-COF. Bookmark the permalink.